Strong willed, with a solid constitution. Most adept at gaining the trust of his comrades. Ranked no 2 of the trainee class. Helps Eren out during his training days. 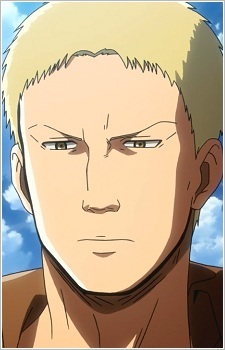 It is later revealed that Reiner is a Titan-Shifter. He is the Armored Titan that opened the gates of Wall Maria along with his partner Bertolt, the Colossal Titan, with the intention of slaughtering the wall's inhabitants. If you're a fan of Shingeki No Kyojin (Attack on Titan) you've probably got a few favorite characters that are hopefully still alive. Here are some of the most interesting characters.